State grants will help Superior and its partners evaluate and develop a management plan intended to secure the future of Wisconsin Point, an area of wetlands, forests and sand dunes on the Lake Superior shoreline. The combined $50,000 in grants, provided by the Department of Administration's Coastal Management Program and the Department of Natural Resources, will help pay to assess the 2,800-acre site's natural resources, conduct a public outreach effort to gather citizens' ideas and desires for the area and develop a plan to achieve and sustain those goals. "Wisconsin Point is a natural gem with great potential for outdoor recreation and cultural, scenic and natural resources preservation," says DNR Secretary Matt Frank. "We are pleased to help support and participate in a collaborative effort by the city and its many partners to help Wisconsin Point achieve its full potential." The funding and partnership grew from a visit city representatives and local residents made to Frank's office during Superior Days in Madison in February 2010 and a visit by Governor Doyle to Wisconsin Point last August. Improving land management of Wisconsin Point, a largely undeveloped corner of the city owned by several public entities, was one of the top items on the city delegation's list to discuss with DNR officials. Wisconsin Point has long been a favorite recreational area for picnickers, hikers, birdwatchers, anglers, duck hunters, and swimmers. The northern end of the point area is the Wisconsin entry to the Duluth-Superior Harbor and is also the site of an historic Native American village and burial ground. The Fond du Lac Tribe is an important partner in the planning effort. The point is jointly owned by The City of Superior and Douglas County, who are the largest landowners, the U.S. Coast Guard, the City of Superior School System, the DNR and private owners. 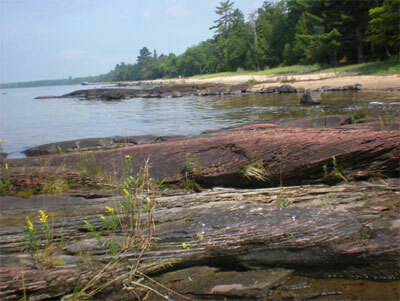 Part of the site was also recently designated the Lake Superior National Estuarine Research Reserve, which is managed by the University of Wisconsin-Extension. The reserve will be managed to "protect and enhance the ecological health of the St. Louis River Watershed and Lake Superior coastal habitats." "We are very pleased with the state's commitment to this project," said City of Superior Mayor Dave Ross. "We look forward to working in partnership with the state and the other owners to develop a plan which reflects a joint community and landowner vision for the future of Wisconsin Point." DOA Secretary Daniel Schooff said the Superior community has been a long-standing partner with the state on a number of important issues, including environmental stewardship. "This grant will strengthen this relationship and will foster future partnerships by allowing a variety of stakeholders to work together to determine how to best protect this popular natural area." State Senator Bob Jauch said that Wisconsin Point is one of Wisconsin's great natural treasures and the funds will assist the community in managing this beautiful resource. "This grant is yet another example of the long list of state investments for northern Wisconsin from the Doyle Administration and I am grateful for Governor Doyle's leadership in identifying funds to facilitate a community discussion on protecting this valued property." Doug Finn, Douglas County Board Chair, said he is "extremely pleased to form a partnership between governments, tribe and citizens to develop a long range plan that protects Wisconsin Point." The area covers about 5.5 miles of shoreline and its location at the intersection of marsh, lake and woodland habitat types makes it one of the best migrant bird areas in Wisconsin in the spring. The U.S. Fish & Wildlife Service designates the point as critical habitat for piping plover, a tiny, iconic shorebird species listed as endangered in Wisconsin. The next steps are to conduct an initial assessment of the natural resources present on the site. Partners will gather maps and data, do an inventory of land use and habitat types, and then ask area residents what features and uses of the site are most important. The end result of the project will be a plan to guide the public landowners' management of the area.